It may surprise you to learn that choosing a style is often the last step in the decision process when buying a bracelet. What comes first is knowing a little something about the jewelry preferences of the recipient because you need to match those with the type of bracelet you are going to buy. This is important because your recipient won't wear your choice if she doesn't love it, and if that happens, then what's the point of giving it to her? So a little forethought about her taste in jewelry will bring more value to your purchase. Next comes size. It's obvious that some women have larger or smaller wrists than others, so choose accordingly. If possible, you might be able to measure a bracelet that you know she wears, and proceed from there. Otherwise consult your jeweler for advice about sizing. Bangles Bangles are generally simple circles made of a wide variety of materials, even resin and wood. But if you are considering a memorable gift, it's best to stick to ones that are primarily precious metal. You can even find them embedded with gems, including diamonds, and some feature striking enamel patterns on gold backings. Silver is a terrific choice for a price conscious budget. As a whole bangles tend to impart a sense of fun and even frivolity, a good thing to keep in mind when choosing which type of bracelet to buy. 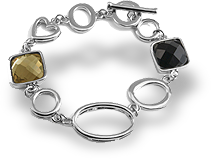 Gemstone Bracelet Gemstone bracelets offer a splash of color from a variety of precious stones including colored diamonds. These range from single stone styles to something like the tennis bracelet which has multiple stones on multiple links. There are a huge number of choices in between. And you can get an entire rainbow's range of color. Charm Bracelet One of the strong points in choosing a charm bracelet is that it offers a chance to give a personalized gift. Charm bracelets range from a simple chain from which dangle individual charms to a coordinated series of charms made by one manufacturer. The variety is almost endless in both approaches, as both individual charms and topically-themed ones have have tens of thousands of items to choose from. One of the most popular style of charm bracelets is the mother's bracelet - also perfect for grandmothers - which has a charm for each child (or grandchild). And this category of bracelet is one that serves as an ideal gift for any occasion, including bridal. The only other advice that is universally relevant here is that bracelets made of gold are probably your most versatile choice. Because gold as a material finds favor in multiple categories, it makes a gift that is hard, if not impossible, to not like.